On every piece of Ace & Jig clothing is a stripe. Fat or thin, abstract or clearly defined, jagged or pin-straight; each stripe tells a story of where the Brooklyn-based label has been and where it’s going. 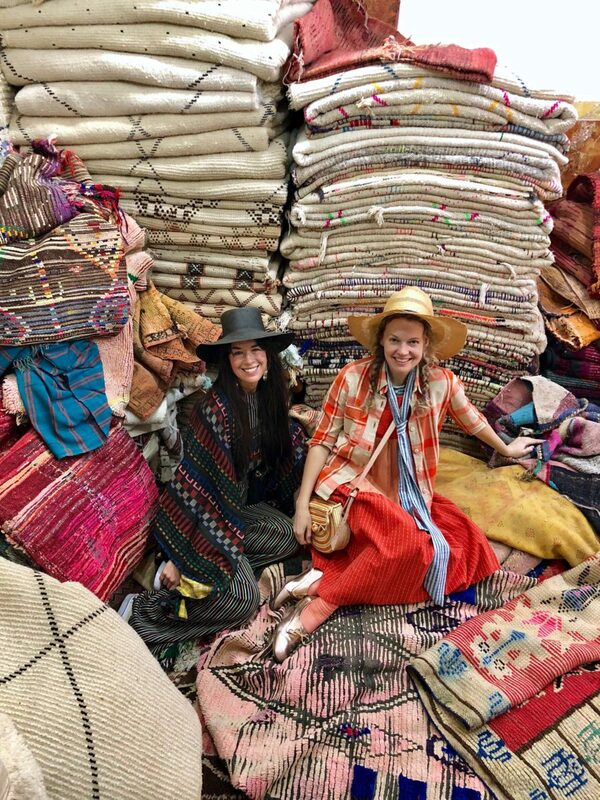 The women behind the earthy, bohemian brand, Cary Vaughn and Jenna Wilson, travel for work often, primarily to ensure quality and source textiles—and to remain inspired. 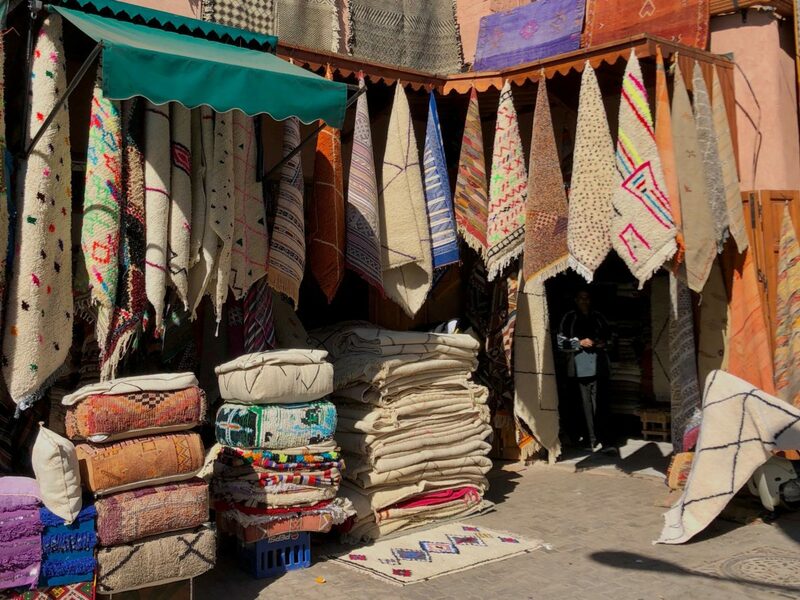 On a recent trip to Morocco, for example, the duo savored the colors and textures of Marrakech. 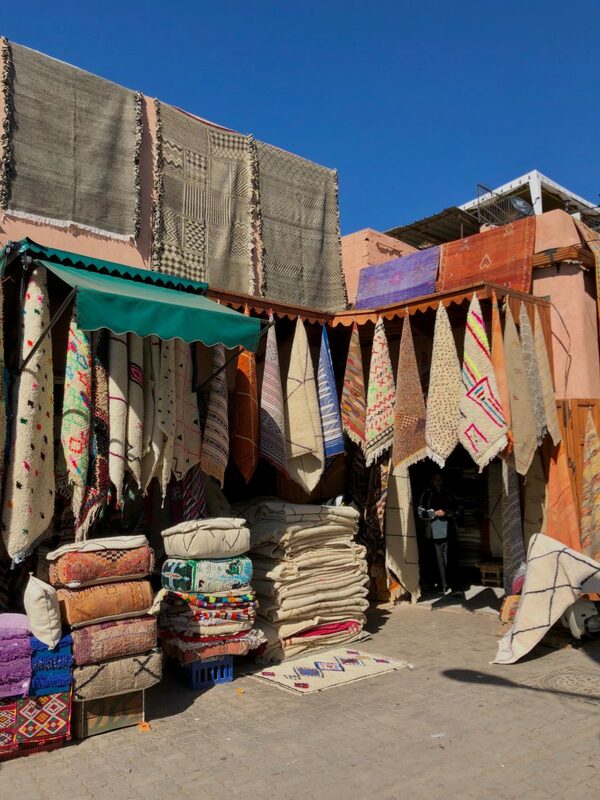 From market to market, their bold-patterned pieces simultaneously stood out and blended in with the soft severity of the North African desert as they began dreaming up their next collection. 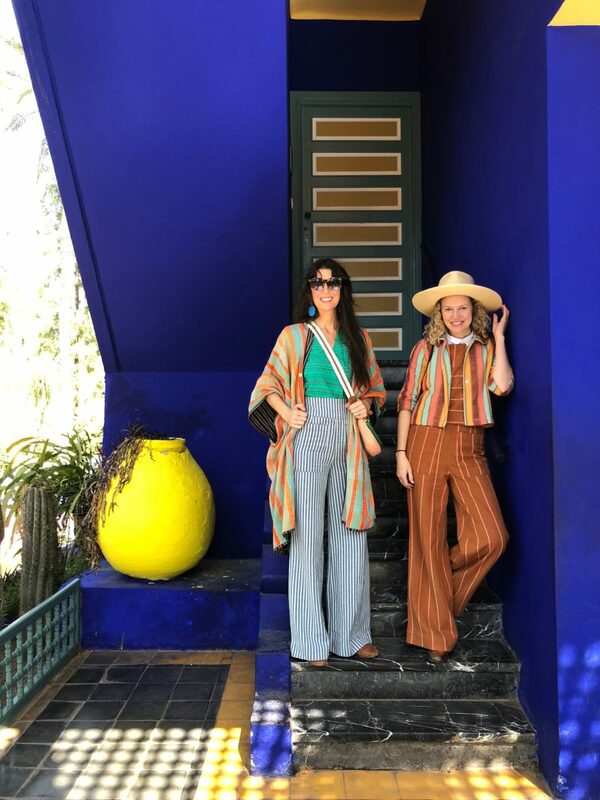 Bleu majorelle! Soaking up sunshine at the Jardin Majorelle against the brilliant cobalt blue of the garden's cubist villa, designed by Paul Sinoir in 1931. 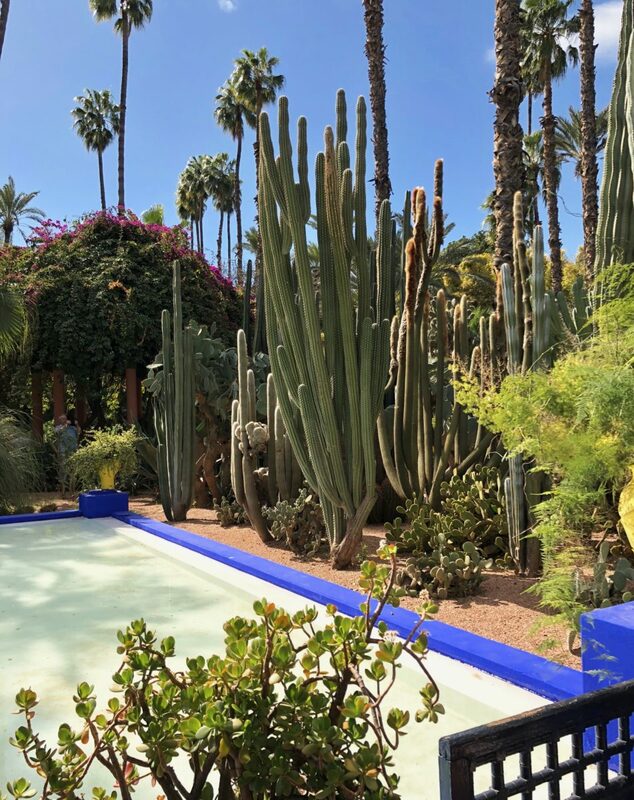 Wandering among the towering cacti of the Jardin Majorelle, rejuvenated by Yves Saint Laurent and Pierre Bergé, who owned the property until 2008, since purchasing and restored the property in the 1980s. Blue building, blue skies. 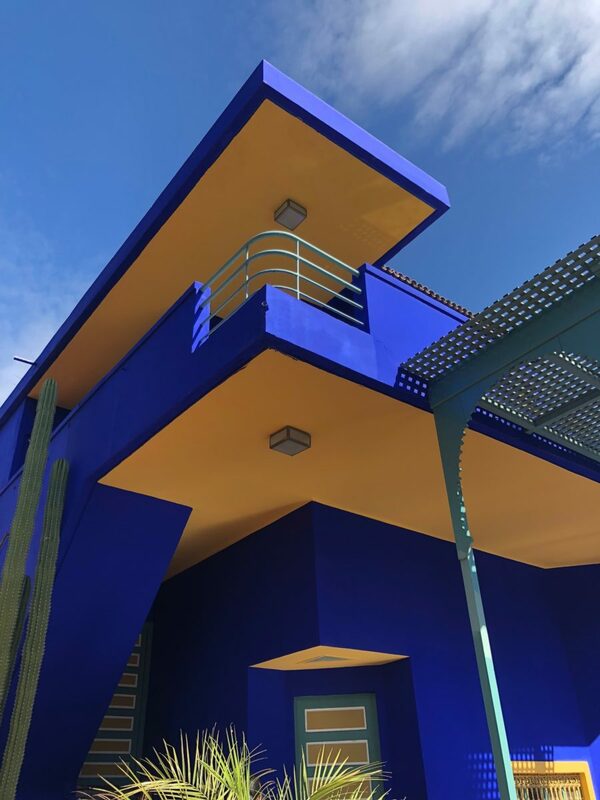 Jacques Majorelle's cubist villa at the center of the grounds. 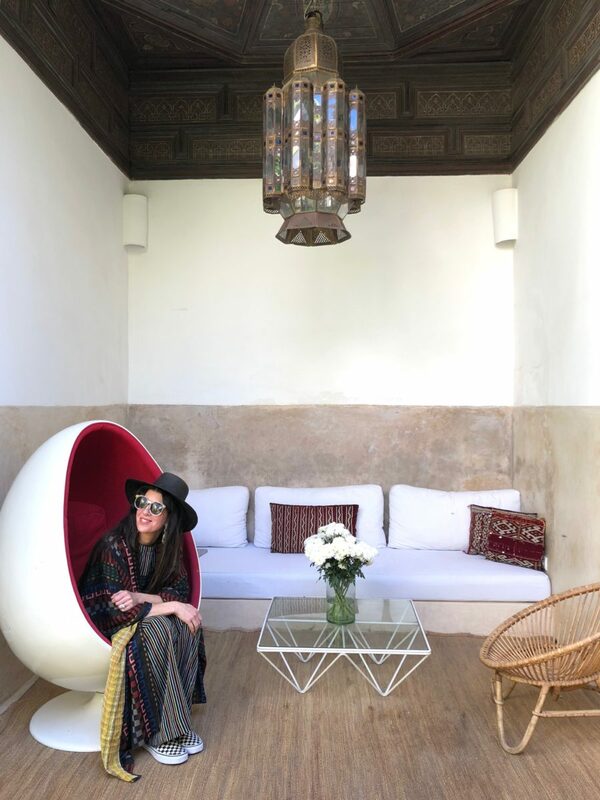 Cary in our private oasis in the medina: Riad Mena & Beyond. Here, fresh orange juice and marmalade made from the fruit of trees in the courtyard are a daily ritual. 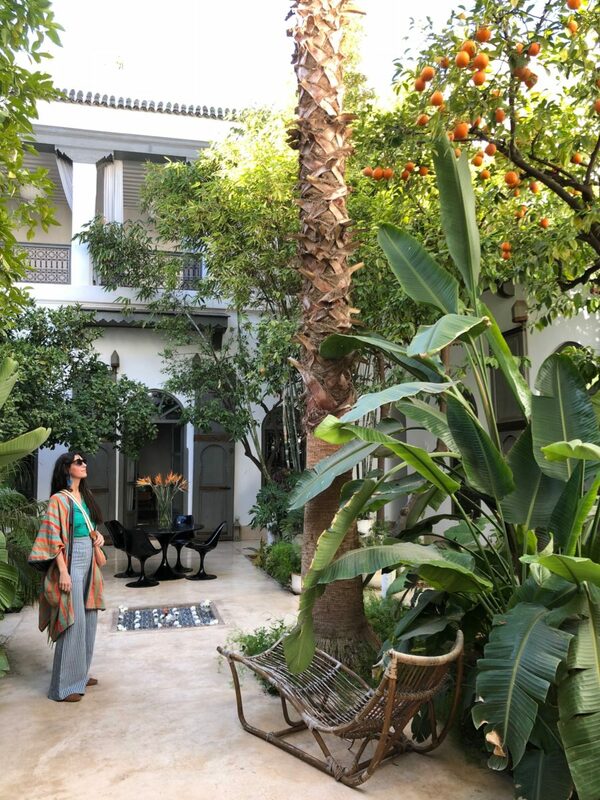 Breakfast at the Riad Mena: Moroccan mint tea, khobz and harcha with butter, and honey with fresh fruit and yogurt—enjoyed in pure peace. 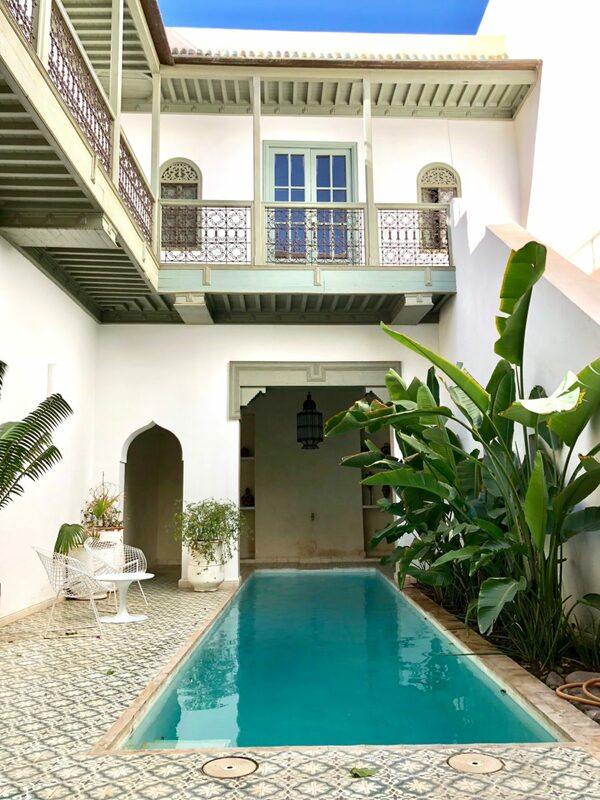 Pausing for the early-morning reflections in the tiled pool of the Riad Mena. 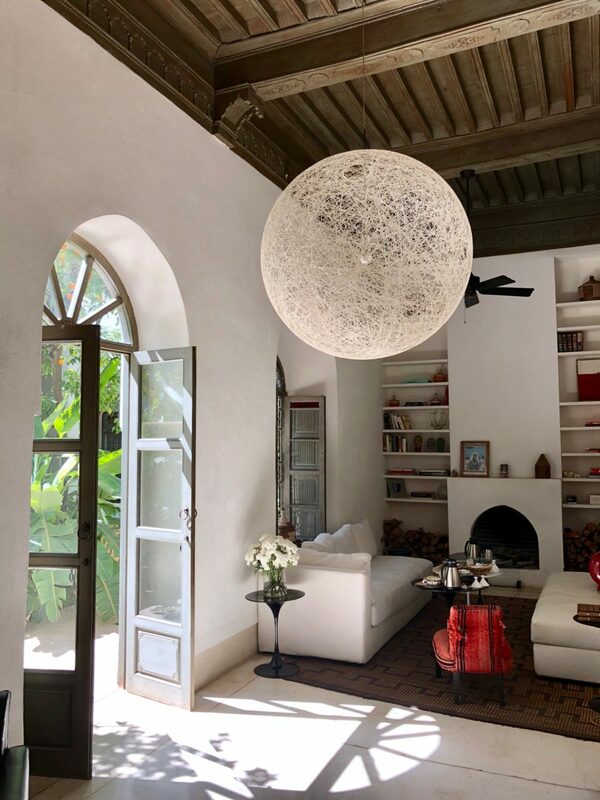 Cary in the serene and chic interiors of the Riad Mena, a collaboration by globetrotter Philomena Schurer Merckoll and Swiss designer Romain Michel-Meniere. Marrakech medina mornings, before the madness and crush of crowds. 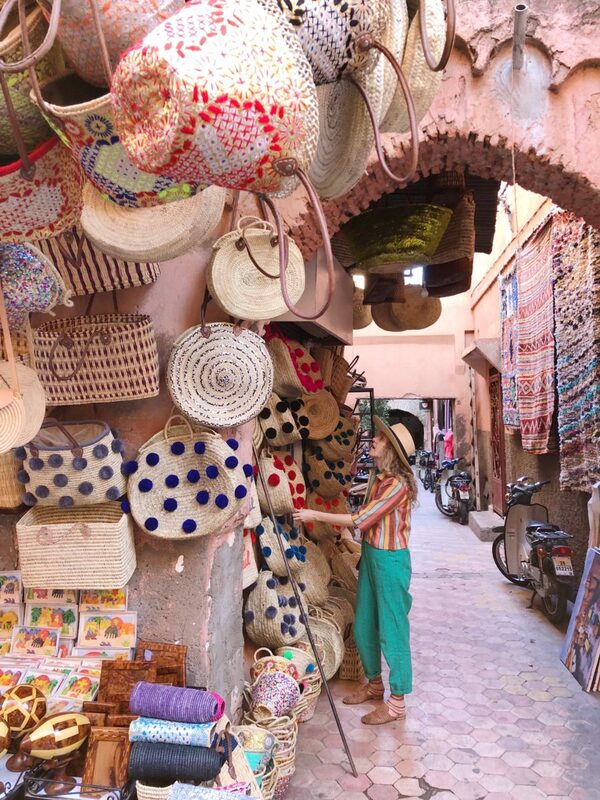 Jenna admiring the abundance of colors and textures in the medina. 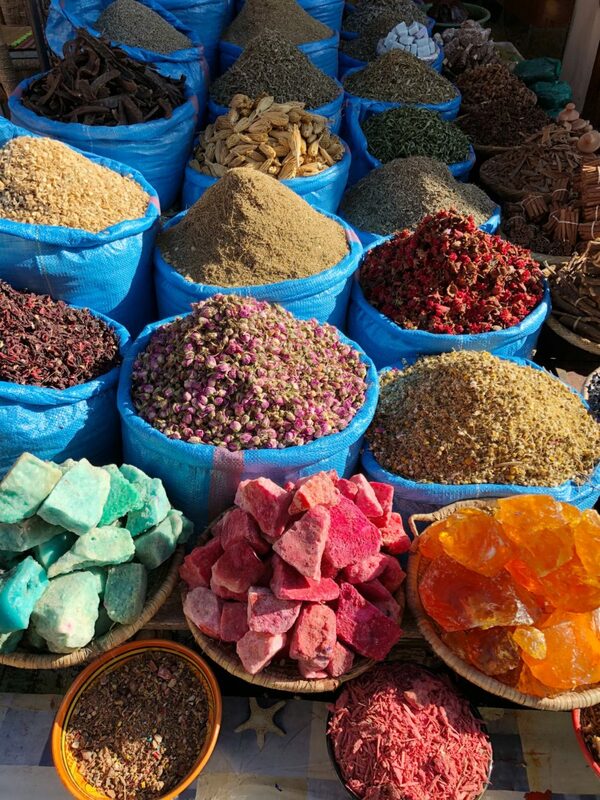 We wound through the narrow alleys of the medina, allowing ourselves to be carried by the currents and crowds, but always finding our way back at last to our center: the Rahba Kedima "Spice Market." 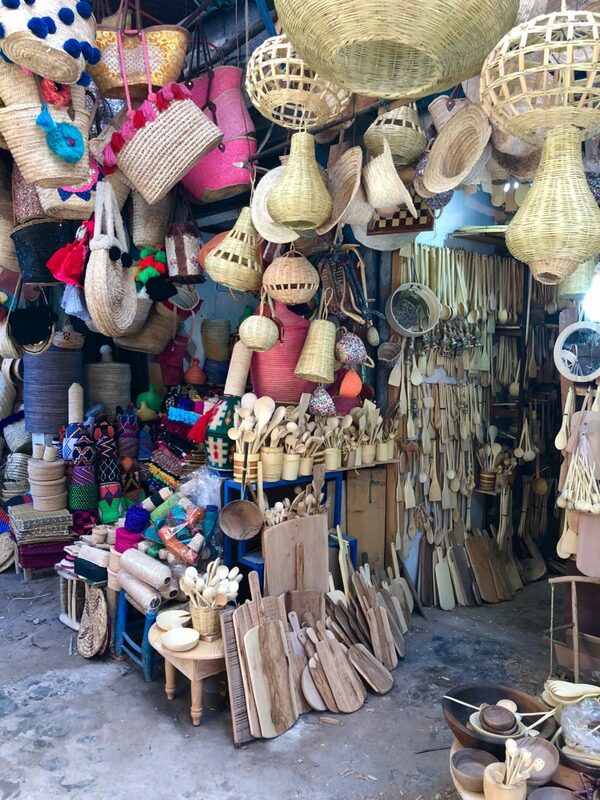 A wrong turn in the right direction led us to the bounty of the basket market. 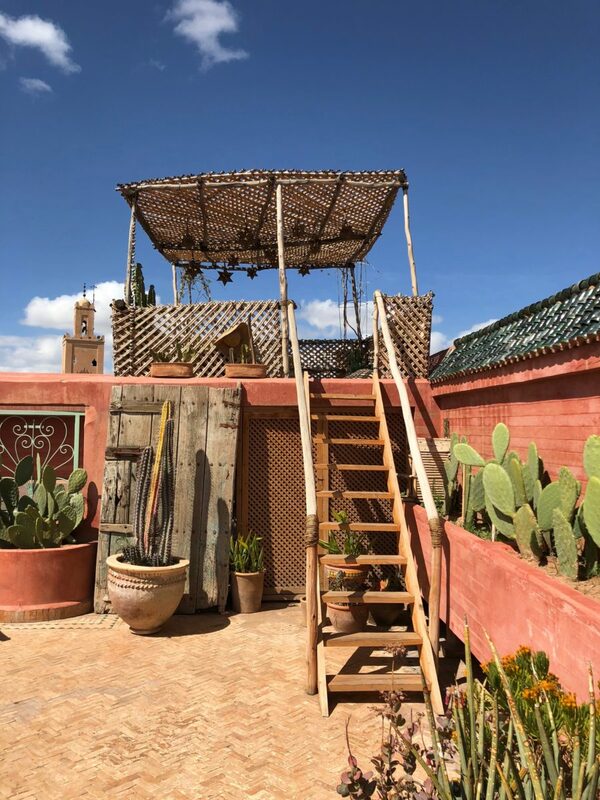 The blissful pink rooftop of the Riad Jardin Secret. 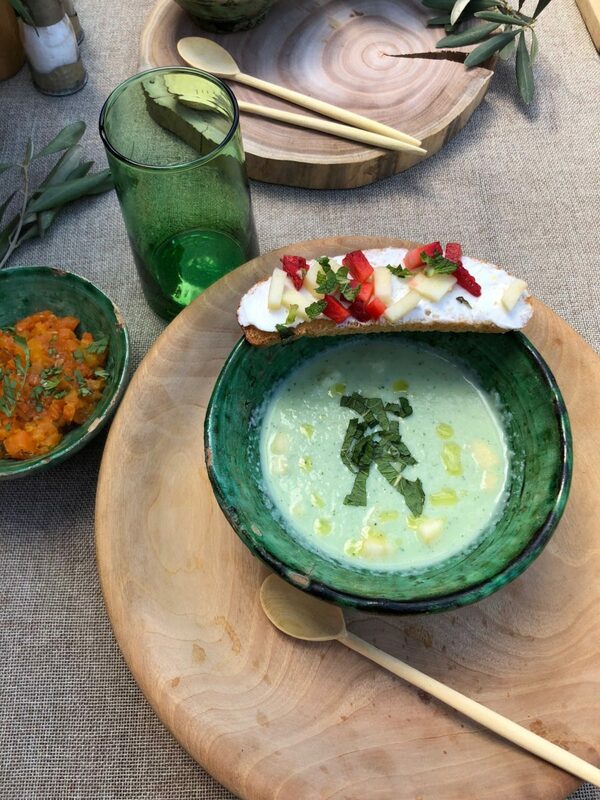 Lunch break at the Riad Jardin Secret for the most delicious three course traditional vegetarian meal, including a cold cucumber apple soup. 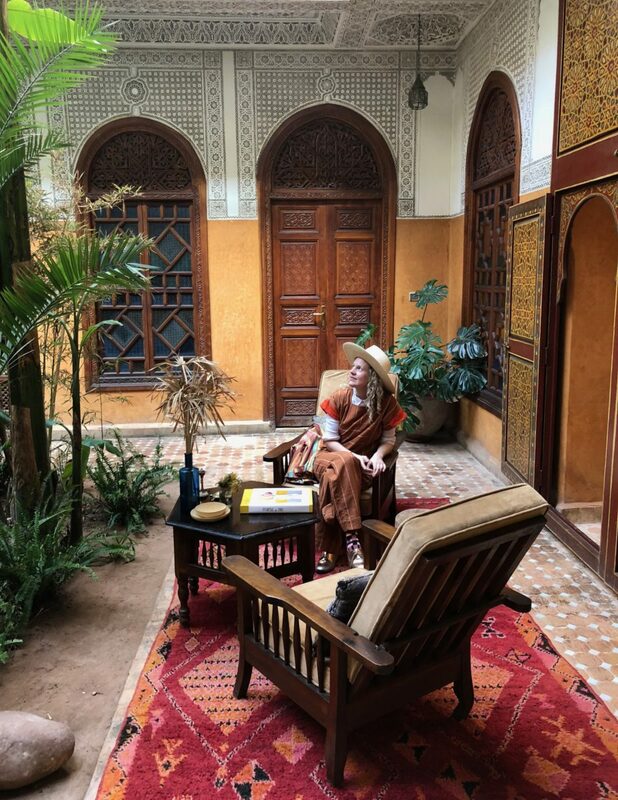 Jenna absorbing the sumptuous interiors of the Riad Jardin Secret. 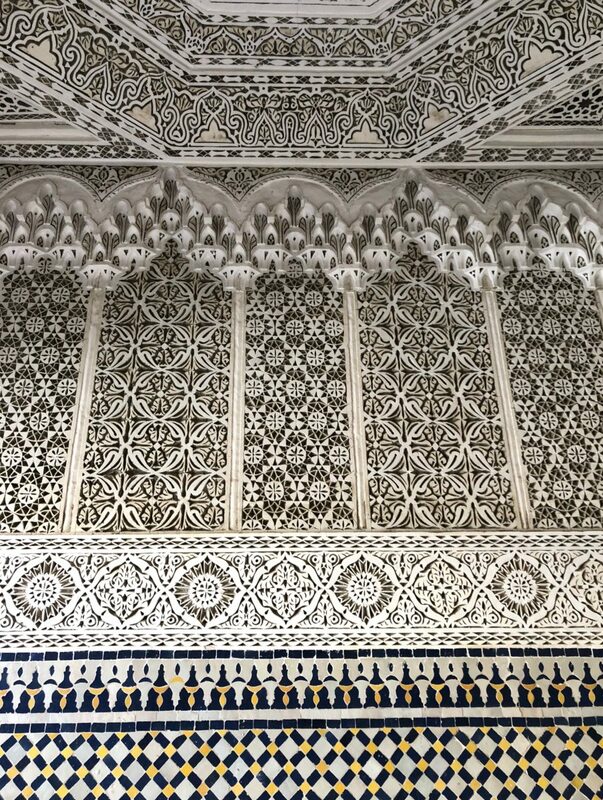 The Riad Jardin Secret's awe-inspiring, intricately-carved wood and tile. 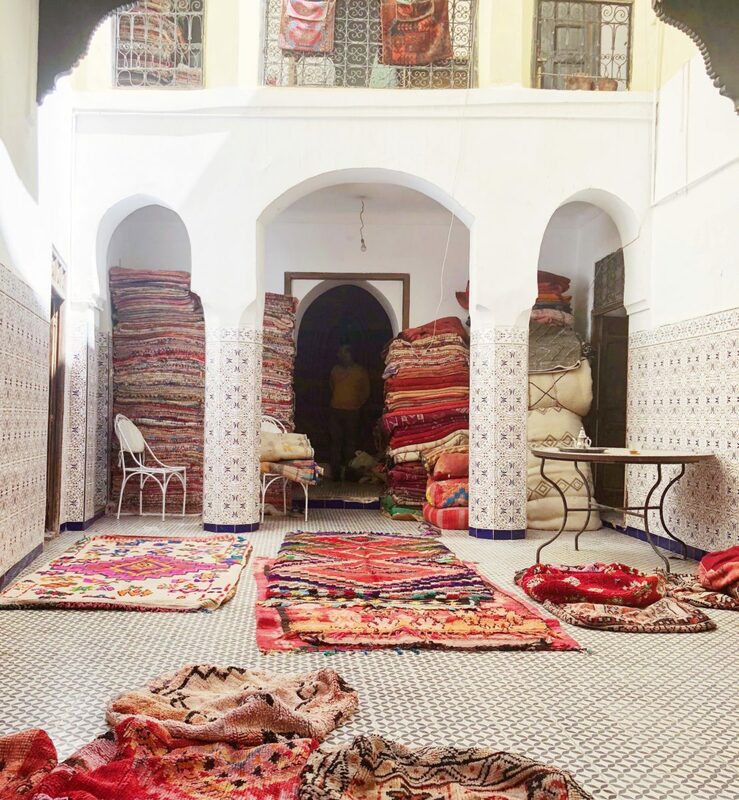 Behind the Benyoussef mosque, there is an unmarked red door that leads to this magic known as vintage Moroccan carpets—our favorite rug shop in the medina. 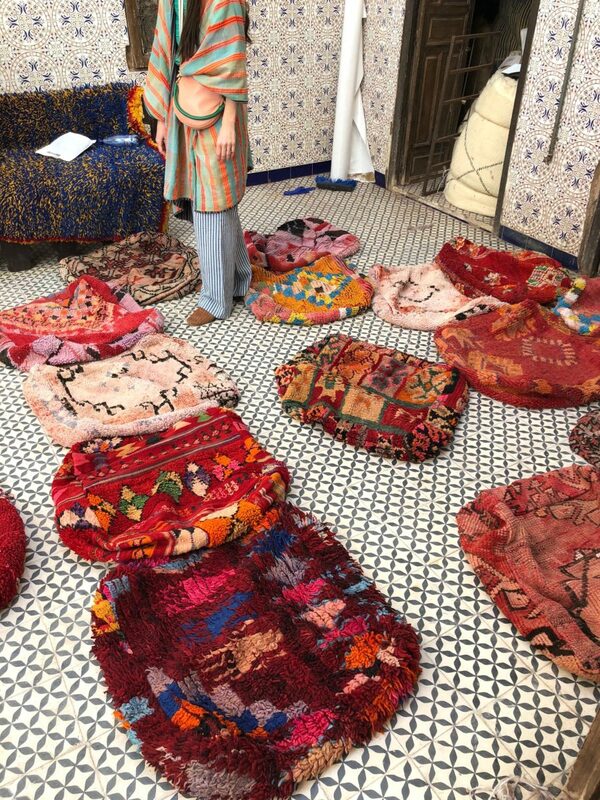 How is one to decide between all these vintage Moroccan poufs? 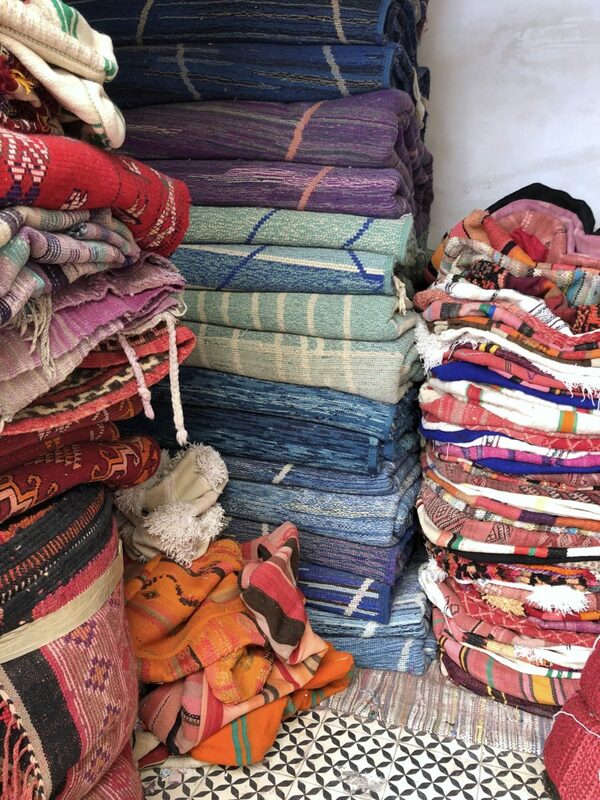 Stacks of vintage Kilim, Boujaad, and Boucherouite rugs, stored inside out. As each is unfolded, a riot of color and pattern springs to life.